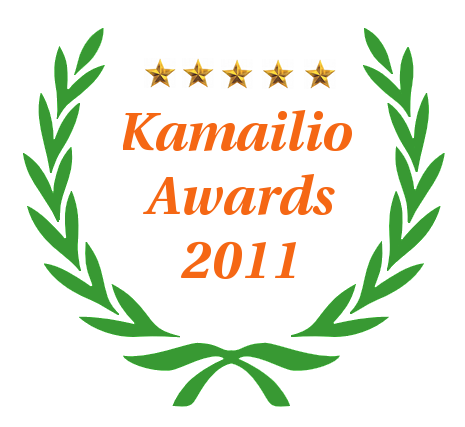 End of winter, therefore it's now time for the 5th edition of Kamailio Project Awards, granted for the activity during 2011, like in the past, each category has two winners. First, I want to thank to everyone contributing to and using Kamailio/SER during 2011, their effort made possible to release a new major version with tons of new features - see release notes for v3.2.0. the project itself - it succeeded to survive over 10 years since it started. There were many critical moments in the past (forks, renames and such), but it went through, becoming even stronger now, with an exceptional support from an amazing community. the development team - it succeeded to get on board lot of new contributors. This made it very hard to select the winners for Developer Remarks awards. According to Ohloh statistics, there were over 30 registered developers contributing code during the past 12 months. The new category this year is Friends of Kamailio, for persons that helped for many years in various occasions, in background or foreground, and were always promoting and saying good stories about the project. Next are presented the categories and the winners. CSDN - the "Chinese Software Developer Network" - for spreading out news and tutorials about Kamailio, our Asian user base grew substantially lately. Jason Penton and Richard Good (the two being colleagues, were tied together here) - for many useful posts of how to deal with Kamailio on Solaris. The two are contributing code to the IMS extensions in our project. Gemeinschaft - a project that aims to provide a secure, scalable and easy to use open source PBX platform built with Kamailio and FreeSWITCH, developed by Amooma and sponsored by the German Federal Office for Information Security (BSI). Homer - SIP Capturing Server started by Alexandr Dubovikov, developed first time for Kamailio SIP Server project and adopted by other VoIP applications. In one side, Kamailio can be configured to mirror the SIP traffic, on the other side Kamailio can receive the mirrored traffic and save it to database from where it can be searched for various keywords via a web interface. Then, it can build diagrams from results or the results can exported in pcap format. Jon Bonilla - for setting up the Debian/Ubuntu APT repositories, updating the .deb specs and maintaining them. It made the spreading through packages and installation lot more easier for these distributions. Laura Testi - for substantial feedback, testing and many patches on our SIP SIMPLE Presence extensions. I I would award development topics, SIMPLE Presence extensions would have been among the top ones in 2011 (user presence, dialog states (aka blinking lamps), resource list services, embedded XCAP server, SIP-XMPP presence gateway). Laura helped a lot to improve and develop further these components. dmq - Distributed Message Queue on top of SIP - the module presents huge potential and building a native distributed platform with Kamailio, personally I expect several modules to use it soon as underneath layer for data exchange between SIP server nodes. The developer is Marius-Ovidiu Bucur. json - JSON Parser and JSONRPC Client - json format has become very popular, being able to interact directly from the config file, opens the way to integrate easier with backend structures used for Web 2.0 services. As a plus, JSONRPC client uses the asynchronous processing framework added starting with v3.0.0. The developer is Matthew Williams. Peter Dunkley - he and Crocodile RCS team contributed major enhancements to SIP SIMPLE Presence extensions towards RCS/RCSe (e.g., user presence services, resource lists services, embedded xcap server), as well as scalability. For a fair acknowledgement of contributed work, I am mentioning also his colleagues Paul Pankhurst, Hugh Waite and Andrew Miler. Timo Terras - by contributing SQLite database connector, running Kamailio on embedded systems entered in a new era. The primary choice in the past as DB backed for embedded devices was dbtext module, but it has limitations dealing with large records. With SQLite, any module can be fully functional on very small devices, from user authentication and authorization, sqlops, to location and presence services. Carsten Bock - for participating at, organizing and sponsoring several events related to Kamailio SIP server as well as publishing blogs and news about the project. Henning Westerholt - another year with Henning on traveling to most of our public events, speaking about the over 3 000 000 VoIP users platform he is involved in, with special credits for taking care of our LinuxTag 2011 presence, booth and slides. Portugal Academic Network - for running a large grid of Kamailio and Asterisk servers (about 500) to provide communication services. Credits to Ruben Sousa (at Astricon 2010) and Olle E. Johansson (at 10 Years SER event - the slides from previous link) for sharing their experiences in deploying this VoIP network with us. Telio - one of the oldest companies with development contributions to SER/Kamailio project, Telio continued to have in 2011 good revenue growth. I am adding also a special remark for its movement towards mobile networks, with launch of Goji application. Crocodile RCS - one of the few players in the vendors market with a clear target for Rich Communication Services, their team was very active in the development process of Kamailio during last year. Mobile operators are in a rush to roll out value added services, especially in the social networking area - real time instant messaging and presence are going to play a crucial role for operators in their battle with the big Internet companies. Frafos - with a business oriented mainly to SIP Express Media Server (SEMS), the project started in the same place as SIP Express Route (SER), having many common developers, the company can help deploying addition components in Kamailio-based VoIP platform, to achieve functionalities such as media server (voice mail, conferencing, IVR), back to back user agents or session border controllers. 10 Years SER - the project crossed first time the age of 2 digits, a good opportunity to meet and look at the past, present and future. About 50 people spent a great day at FhG Fokus in Berlin, from first developers to our latest users. There were 15 presentations during the day and a relaxing grill party in the evening. LinuxTag - we were several time in a raw at LinuxTag with a booth for the project and presentations about it, but the last year we had the opportunity to meet in the same place 5 out of 11 members of the management team, pretty rare situation as we are distributed over many countries. Columbia University - for using our SIP server to conduct various research projects since 2002, results from some of them being useful and relevant for development and scalability of SER/Kamailio platforms. The Green VoIP paper showing interest results, like ability to cope with about 43 000 active TLS connections on a server with 2GB memory allocated for the SIP server. Worth to mention that Jan Janak, one of the major contributors to the SIP server, has been involved in some of the research projects. FhG Fokus Research Institute - for being a host of 10 Years SER event, but overall for starting in 2001 and funding the development of our SIP server project for many years. Also, during the recent past years, Fokus hosted several developer meetings. Another relevant contribution to the VoIP environment coming from Fokus is the OpenIMSCore project, developed on top of SER/Kamailio, several components from it being integrated in our project. Olivier Taylor - for helping to organizes our meetings in Brussels, at Fosdem events. By now, for the last several years in a raw, Olivier did his best to select nice places to meet and enjoy great time with folks around Kamailio project and VoIP arena. Suzanne Bowen - an exceptional friend of open source telephony applications, Suzanne was ready to help always with written interviews and podcasts, free invitations to conferences and exhibitions, setting up connections, recommendations and discussions to various business entities, to reveal in the best way the benefits and strong points of Kamailio. Several folks involved in Kamailio SIP Server and VoIP in general (including me, Daniel-Constantin Mierla, co-founder Kamailio) are organizing a social networking event in London, during the evening of 6th of March. Be sure your email is valid in order to send you the details of the location. The event will be dinner/pub-drinks style, with the goal of discussing the latest developments of Kamailio project as well as what is new in VoIP and Unified Communications world. UC Expo 2012 takes place in London, UK, between March 06-07, 2012. Asipto representatives will be present this year as well at the event, meeting many of our UK customers base that will exhibit at the show. UC Expo describes itself as the show mirroring the diversity of Unified Communications by bringing together all the key technologies and key people of this rapidly evolving world. I will be present at Call Center World congress in Berlin, February 27 – March 01, 2012. If happens for you to be around and want to meet, feel free to contact us. The event gathers over 250 exhibitors from around the globe, mainly focusing on help desk and support solutions, integrating SIP/IP and TMD for call centers. Along with the exhibition, there are workshops and the conference. Asipto’s offerings include reliable solutions to scale and enhance security as well as add new features to call center oriented systems. For example, the load balancing solutions can be used to scale call center capacity in a transparent and flexible manner. CeBIT 2012, the biggest digital show, takes place in Hanover, Germany, March 06 – 10, 2012. Daniel-Constantin Mierla (me in other words) of Asipto, co-founder and core developer of Kamailio SIP Server project, is visiting the event. The exhibition has dedicated pavilions for Telecommunication Industry, from equipment providers to software integrators. Asipto is glad to see several customers exhibiting there and we will be delighted to meet and discuss with the other participants at the event, as well. Fosdem 2012 included a DevRoom for Open Source Telephony, Daniel-Constantin Mierla of Asipto participated and presented “Secure SIP Communication with Kamailio”. First part focused on an overview of the project, history and latest new features, then continued to present the tools offered by Kamailio to achieve strong security in your VoIP deployments. If you have questions related about SIP security or look for consultancy in this area, our experienced team can help you, feel free to contact us. Daniel-Constantin Mierla (co-founder) and Alex Balashov (member of management board) will coordinate a new session of VoIP Users Conference (VUC) about Kamailio SIP Server, on Friday, the 17th of February, 2012, starting at 17:00GMT. There will be other developers and users around, ready to answer whatever questions you may have. The session targets first to give an update on latest developments: asynchronous TLS layer, asynchronous SIP processing, SIMPLE presence extensions, embedded HTTP-XCAP server and MSRP relay, no-SQL storage systems (Redis, Cassandra), embedded interpreters (Lua, Python, C#), a.s.o.